FOLLOW THESE SIMPLE STEPS TO A NEW DIGITAL MUSIC EXPERIENCE. This is the first and most important step in transforming your music collection. Clean intelligently fixes all of your mislabeled song information, like "Track 01" and "Unknown Artist". Using Clean first will also ensure that TuneUp's other products can really work their magic. TuneUp should automatically open when you launch iTunes or Windows Media Player. If you don't see it docked right alongside your player, double-click the record icon in your Applications Folder (if you're on a Mac) or from your Start Menu (if you're on a PC). Once TuneUp is open, click the Clean spray bottle to begin cleaning. The first time that you open TuneUp, it will need to process your music library. Processing time varies depending on the size of your collection. If you have a small collection, you might not even notice. If you are a digital music pack rat, you may have time to grab a tasty beverage or watch that crazy honey badger video on YouTube... again. 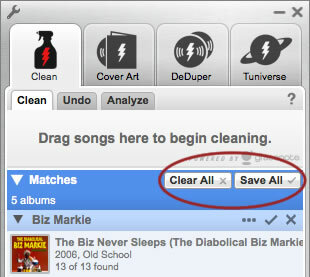 Select the tracks that you want TuneUp to clean by sending them into the Clean tab. We recommend using Analyze first to identify tracks that need Cleaning, and sending no more than 500 songs at a time into Clean. iTunes Users: Select your mislabeled tracks from iTunes and drag them into TuneUp. Windows Media Player Users: Select mislabeled tracks from Windows Media Player, right-click and select ‘Send To TuneUp’. TuneUp will group the results by albums and confidence levels. Save the results for an individual album by clicking the check mark. Save all album results for a confidence bin (Matches and Likely Matches) by clicking the Save All button at the top of each bin. If you would prefer not to save the album results, then click the X or Clear All button. Be sure to take a look at your Preferences, especially if TuneUp is returning a high number of 'Greatest Hits' results, or you only want TuneUp to clean certain fields (like Album and Artist Name, but never Genre). Click here for more information about accessing and adjusting your Preferences. If TuneUp happens to misidentify something, use the Undo tab to restore the old information. Use Clean periodically as your music collection grows. We recommend sorting your music collection by 'Date Added' and cleaning new albums and tracks that you've added to your collection. For more help with Clean, click here.